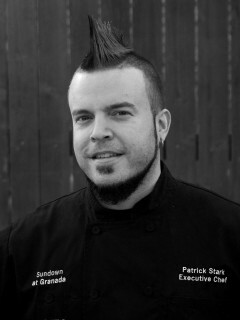 Patrick Stark, the colorful, one-of-a-kind chef and manager at Sundown at Granada, has resigned after six years to catch his breath and regroup. Stark, who left the employ of Sundown on July 31, said he was grateful for the opportunities he had and for all the support he received from Dallas diners, as well as his kitchen staff. "I've been there six years, which is a long time to be anywhere," says Stark, a nominee for Rising Star Chef in the 2014 CultureMap Tastemaker Awards. "It was a good six-year run, but time for a change." In his tenure at the restaurant, Stark helped owner Mike Schoder turn Sundown at Granada into one of the city's leading proponents of local and sustainable food. The kitchen's list of suppliers comprises nearly every local purveyor, from Amelia's Farm to Hail Merry to Dallas Urban Greens. The restaurant is also a top pick for vegan and vegetarian diners. Not only does it have a selection of vegan items, but it can also "veganize" any dish on the menu. Schoder said that Stark had been an "awesome comrade and friend." "We're saddened to see him go," Schoder said. "He was there to help us when Julie and I set out many years ago to open a restaurant that was about purity and organic food - not just vegetarian and vegan, but great quality eats." Schoder said that the restaurant would continue on its current course with Billy Cooper in the kitchen, who was promoted to chef four months ago when Stark switched from kitchen to front of the house. With his eye-catching Mohawk and amiable personality, Stark has been a magnet for diners and publicity. He's appeared on a number of reality TV cooking shows, including Cutthroat Kitchen, Taste and Rewrapped. Stark realized his move from running the kitchen to serving as general manager burned him out. He found no time for extracurricular activities he cherished, like working on his charity or playing music with his band. A visit to his doctor revealed early signs of an ulcer, and Stark determined that his situation might not be good for his health. "It entailed 12- to 13-hour shifts, where I was getting home at 3 or 4 in the morning," he says. "It got to where it started to impact my sleep schedule." He says he'll take some time to catch up on sleep and is looking forward to exploring the next chapter of his career. "It's time to figure out what’s next for Mr. Stark," he says.